Maryland is making slow progress toward the goal of providing "treatment, not incarceration" to nonviolent substance abusers. The number of criminal justice-referred drug treatment admissions grew by 28 percent between 2000 and 2004, while drug imprisonment dropped by seven percent. But the state still spends too little on drug treatment for patients referred by the justice system - roughly 26 cents for every dollar spent to imprison people convicted of drug offenses. Jurisdictions that relied on drug treatment were more likely to achieve significant crime rate reductions since 2000 than those that relied on drug imprisonment. In the past five years, elected officials in a majority of states have responded to fiscal pressures and the public's waning enthusiasm for the war on drugs by enacting sentencing and correctional reforms designed to reduce costs and improve outcomes. 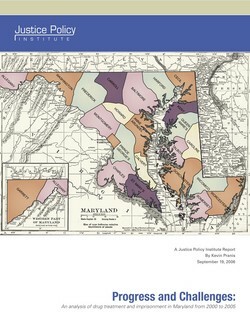 Two years ago, Maryland lawmakers enacted a set of reforms designed to expand the options available to judges, prosecutors, and the state's parole commission for placing addicted defendants in community-based treatment rather than prison. In doing so, the state's elected leaders recognized that the long-term solution to the drug problem lies in "treatment, not incarceration." The number of drug treatment admissions referred by the criminal justice system grew by 28 percent between 2000 and 2004, while the number of people sentenced to prison for drug offenses fell by seven percent. Six of seven areas in the state have seen an increase in the number of criminal justice referrals to drug treatment, and most have watched prison admissions for drug offenses decline over the four-year period. State funding for the substance abuse treatment has risen over the past half-decade, but Maryland continues to invest far more in drug imprisonment than drug treatment. For every dollar spent to imprison people convicted of nonviolent drug offenses, the state spends an estimated 26 cents to provide drug treatment to patients referred by the criminal justice system. The use of drug treatment and drug imprisonment varies widely by jurisdiction. Some counties rely heavily on imprisonment to fight drug abuse while others appear to have adopted approaches that emphasize treatment. Wealthier counties were more likely to rely on treatment, which suggests that funding issues (including substance abusers' access to private health insurance) may play a role. But reliance on treatment and imprisonment also varied among counties with similar incomes, pointing to differences in local practice. Jurisdictions that relied on drug treatment were more likely to achieve significant crime rate reductions than those that relied on drug imprisonment. Eight of the 12 jurisdictions that made greater use of treatment have seen crime rates fall by 10 percent or more since 2000 compared to just two of 12 jurisdictions that made greater use of imprisonment. While many factors affect crime rates, these results are in keeping with national research showing that treatment does more than imprisonment to reduce both crime and drug use. Researchers have found that treatment is a far more cost-effective strategy for reducing both crime and drug use than imprisonment. A research team at the RAND Corporation has estimated that treatment of people addicted to cocaine reduces serious crime 15 times more effectively than imprisonment. Staff at the Washington State Institute for Public Policy concluded in 2003 that a dollar invested in imprisoning people convicted of drug offenses produced just $0.37 in crime reduction benefits, while the state's drug treatment courts produced $1.74 in benefits for each dollar spent. First, state officials could make modest reforms to drug sentencing laws and guidelines that encourage the use of incarceration for low-level drug offenses, thereby freeing up resources and making it easier to sentence defendants to treatment. Justice Strategies estimates that these reforms could reduce annual corrections spending by more than $20 million. Second, the state could follow the recommendations of treatment experts and advocates and commit an additional $30 million to the fiscal year 2008 treatment budget. Such an investment would permit treatment programs to catch up with cost increases and fill critical gaps in capacity. Third, state and local officials could work together to develop a program that provides fiscal incentives for local jurisdictions to expand treatment alternatives to incarceration. Currently, poorer jurisdictions which have the greatest need for treatment alternatives to incarceration often have the fewest options, potentially forcing judges to impose costly prison terms. Successful programs that allow local governments to share in the savings generated by reducing use of incarceration have been employed in both adult criminal justice and juvenile justice systems in other states.